I've heard about people making their own nut milks. So, I reached out to my friend and health chef guru, Manya Williams, for all the details on how to make it!! Watch Manya's video tutorial. She gives so many amazing details that you won't want to miss this... Her secret recipe revealed! I am a huge fan of homemake almond milk (it's WAY better than any store bought kind)... add a little cinnamon, blend it into a smoothie, there are just so many ways you can enjoy this yummy healthy drink! Manya, is also currently featured in 10 Ways to Make 2017 The Best Year Yet. Check it out! Ok, these are the most delicious crispy treats I've ever made. My secret recipe is revealed!! My husband asked me how I made the creepy crispy treats so chewy, gooey and delicious.. as he was going back for seconds! So, I may make the best rice crispy treats around (well, I stole the recipe from my mom!! shh) and the secret is BUTTER! So, you can't just melt the butter like most people do when making rice crispy treats. The secret is browning it! It brings out the richness carmel flavoring of the butter which makes my (my mom's) crispy treats the best around. Check out how to create the yummy gummy goodness! Here's the easy recipe and will take you less than 12 min to make. Did anyone say last minute party food? Well, you can be prepared with this super easy to follow recipe. ***For these crispy treats I used Coco Pebbles instead of Rice Crispy cereal. They already had the dark color I desired and my kids LOVE Coco Pebbles. Melt 1 stick of salted butter in a large pot over high heat. Let it brown. Once the butter starts to brown add a bag of the small marshmallows. Once the marshmallows are soft and look like they've expanded, you will add 1/2 box of Coco Pebbles. Add about another 1/4 box of the Coco Pebbles. Watch out! The mixture is hot. Let cool for 10 min in the fridge. Serve and ENJOY! So dense and gooey!! I spent tons of money on gimmicky kids baking products for my daughter. She loves to make and bake all types of sweets. Her weakness for licking the spoon is unparalleled. So it's hard to find recipes that are safe to eat raw due to the raw eggs. So I set out on a mission.. and I think you're all going to love it! Also, stay tuned for more kid friendly recipes on my blog. This recipe is so quick and easy, it's perfect for the kids to do alone or with your supervision. There really is no baking, just measuring and mixing. And who doesn't love raw cookie dough, right?!! We like serving two ways... take your pick! 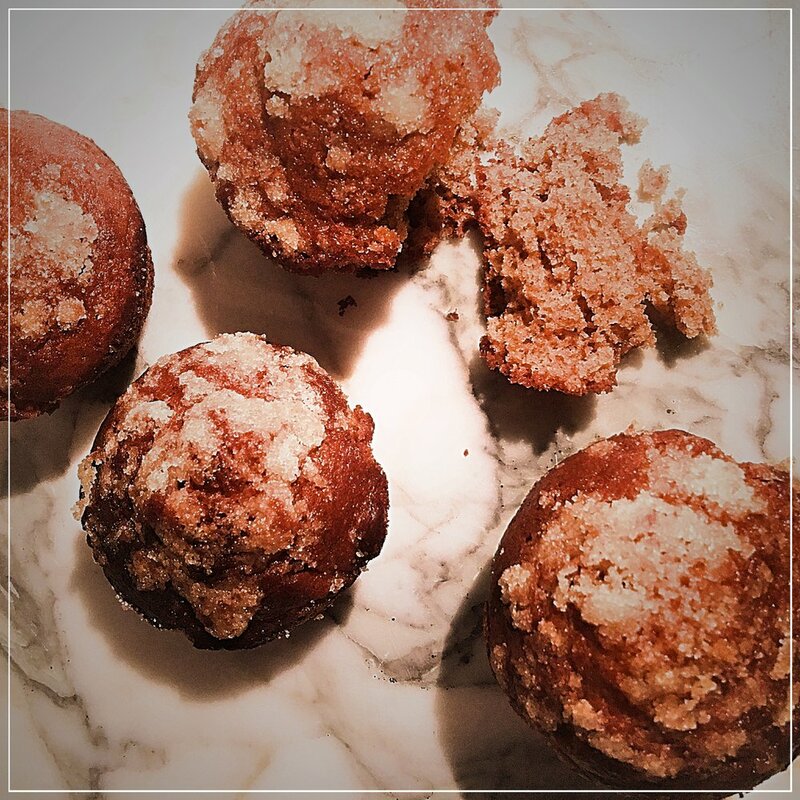 Roll into bite-size balls. Use cake pop sticks to serve. Refrigerate. Enjoy! Pack into small tupperware containers and leave in the refrigerator until chilled. Eat with a spoon and enjoy! When the Fall hits it's like we just can't get enough of the pumpkin flavors! I mean from coffee to cakes the smell and flavor of pumpkin evokes a feeling in us that reminds us that fall is the best season EVER or it could make you think of cozying up in front of a large fire. Whatever the case is pumpkin is a must have in fall. Here is a quick and easy DIY pumpkin muffin recipe that the kids and yourself will be drooling over. Start with Pillsbury Quick Pumpkin Bread mix from the box. Instead of making bread, follow the secondary instructions to make the muffins. You'll be using milk instead of water. ***There are a few other differences but that's the major one. 1/3 cup apple sauce. **This will make the muffins so moist and delicious. They are best served while they are still warm. Cut muffin in half and add a small slice of butter. It will melt in all the little crevices and bring out of the sweet and savoriness of the muffins. Enjoy! Get Your Candy Fix on Movie Night! Since we moved into the new apartment we have been having movie nights at least once a week. And we all know that movie nights are nothing with out popcorn and candy. But who wants to feed the kids all that sugar? Plus, once the sugar high hits, movie night ends.. cause they won't sit still (well at least thats what happens in my house). I've come up with DIY popcorn bowls that pleases even the sweetest of sweet tooth. Each person gets their own personal popcorn container filled half way. I recommend these Sur La Table ones. Put out an assortment of the kids (and yours!) favorite candies in small bowls *this helps limit the amount of candy they can add. Let them add a little of whatever they like to the popcorn container. Trust me.. I've used this on my daughter and she definitely feels like she's getting to eat all the candy she wants! Sweet and salty never tasted this good!! Simple Salad Recipe Better Than Take Out! Lunch time is such an oversight for me since I've had the baby. Take out takes forever at lunch time. And who has time to make lunch? I mean half the time I'm cleaning up breakfast and starting on dinner. Maybe thats just life with three kids but sometimes a girls got to EAT! So invite your friends over on a playdate and wow them with this super fast and easy.. and delicious summer salad recipe. Who doesn't love S'mores and who doesn't love ice cream, right?! Well its not so easy to find a backyard or a fire pit in the middle of NYC. But you don't have to give up your favorite summer dessert! Here is a quick and easy way to enjoy America's favorite treat. Start with half a gram cracker. Layer on a scoop of vanilla ice cream. Drizzle on the hot fudge and a handful of marshmallow mini's. Top if off with the other half of gram cracker! Simple as pie!! Perfect DIY summer get together for kids and adults. Invite the neighborhood kids over and enjoy!